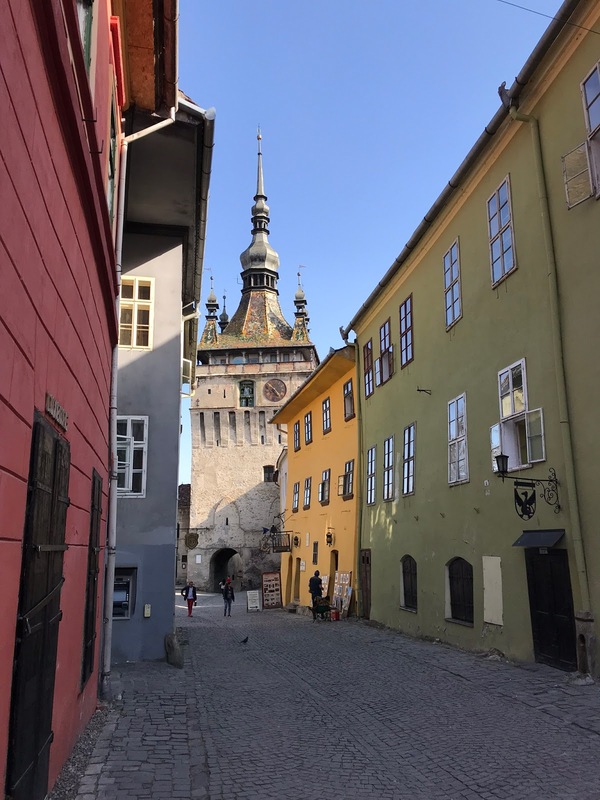 Balkans & Beyond, Day 16: Cluj-Napoca, Romania to Sighișoara, Romania. Last summer when we visited the Nordic and Baltic countries on a seven-week journey, we had booked almost every single lodging and flight before leaving home. On the one hand, life along the way was simpler because we didn't have to spend time making arrangements. The flip side was, we had very little flexibility, or rather it was a bit more complicated to be flexible as it had a domino effect on the reservations going forward. This time we decided to give ourselves more opportunities for spontaneity, and we've already taken advantage of that decision. What may seem like a great idea when you're sitting at home doing research can change completely when you're in the moment. 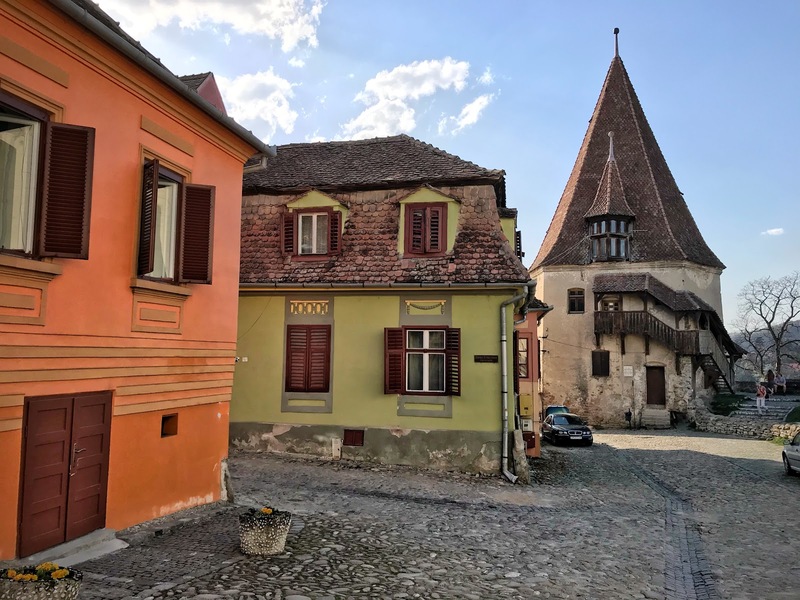 For example, in our original outline, we were to fly into Cluj from Budapest on Sunday and leave Monday morning for a seven-day driving tour of northern Romania. But we were tired coming into Cluj, and the idea of taking off immediately was too much. When we reassessed our plan, we realized we were devoting seven days to seeing one intriguing cemetery near the Ukranian border and four painted monasteries. Yes, they were worth visiting and historically quite interesting, but on balance, we did not think that they were worth seven days when we put things in perspective. Exploiting our flexibility, we spent two nights in Cluj instead and decided to drive south, not north. Our dear cousin Pam had asked a couple of days ago whether we were planning to visit Sighișoara (sig-gee-SCHWAH-rah) while we were in Romania. At the time, we had not even heard of the town. 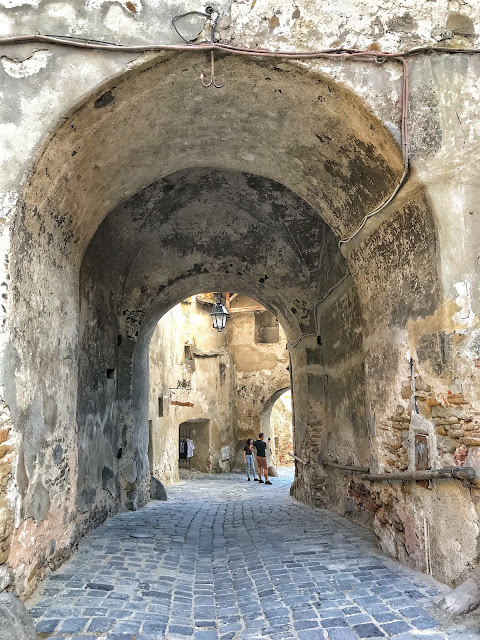 Pam's Romanian co-worker Corina recommended it as a well-preserved medieval town in the region of Transylvania. Consulting the map, we discovered it was right on our path since we had decided to drive south to Bucharest! So thanks to Corina and serendipity, we set off this morning from Cluj on highway A-3, the Autostrada Transylvania, an impeccable dual carriageway in pristine condition (maximum speed limit 81mph). 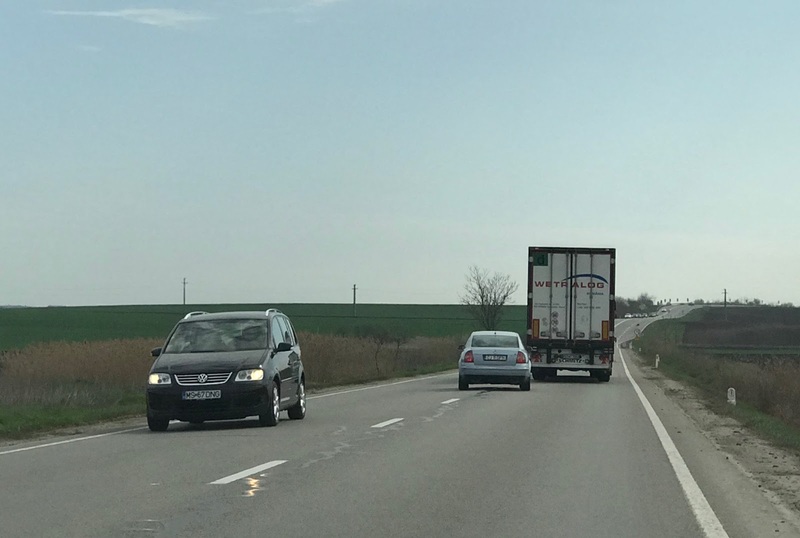 Like so many European freeways, the highway lacked the roadside litter (particularly strips of recapped tire rubber) and road kill that are ubiquitous along U.S. interstates. 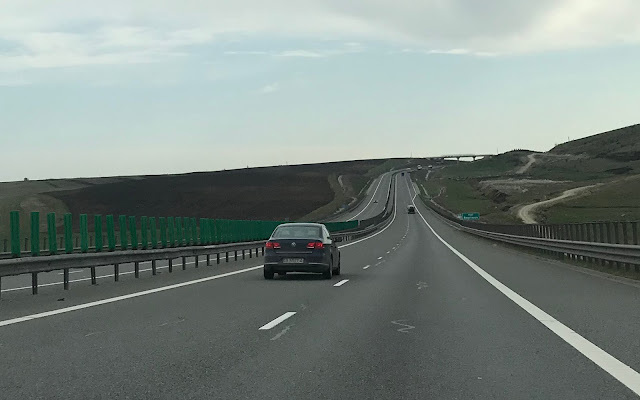 Sadly, after only 25 miles, the A-3 ended and we were shuffled over to E-60, one of Europe's longest roads, running from the west coast of France to the Kyrgyzstan's eastern border with China. This was a two-laner with both cars and trucks passing each other (overtaking, as it's known in Europe) whenever the urge struck, regardless of whether they were on a hill or a curve or could see another vehicle approaching within a couple hundred yards. It was truly dizzying to behold. Latvian drivers clearly have nothing on Romanian ones when it comes to daredevilry. At times, our GPS sent us on a "short cut" along a regional road, full of potholes, enhancing the appeal of the E-60 significantly. Luckily our time on those roads was limited and our tiny VW Polo could dodge between and around most of the tire-popping pitfalls with ease. 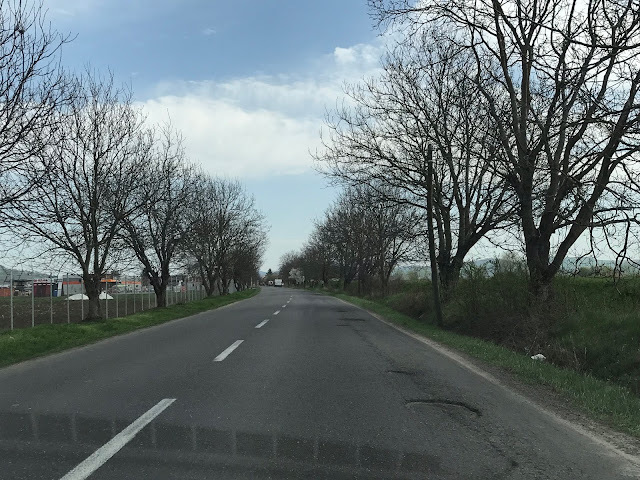 Our route took us through numerous villages of several thousand inhabitants, and often we saw women in colorful traditional dresses along the roadside. 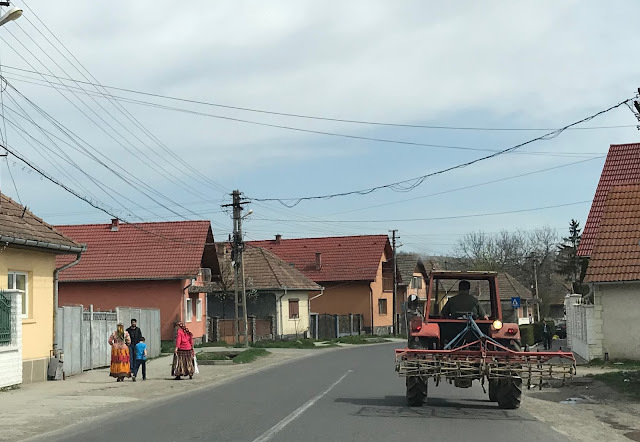 Farm equipment shared the road with cars and trucks, as did horse-drawn carts. Several times, we spied young people riding in the back of these old-fashioned wagons while using mobile phones. By 1:30, we reached the compact city of Sighișoara (population 28,102) and checked in at our hotel. Leaving the rental car there, we walked uphill to the walled old town, listed by UNESCO as a World Heritage Site. 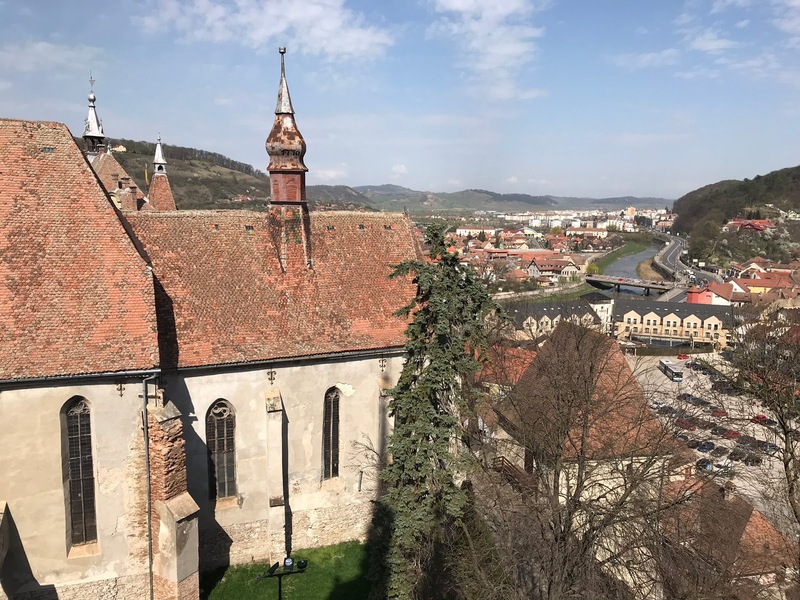 During the 12th century, back when Transylvania was part of Hungary, the Hungarian king invited German craftsmen and merchants to populate his country's frontier. 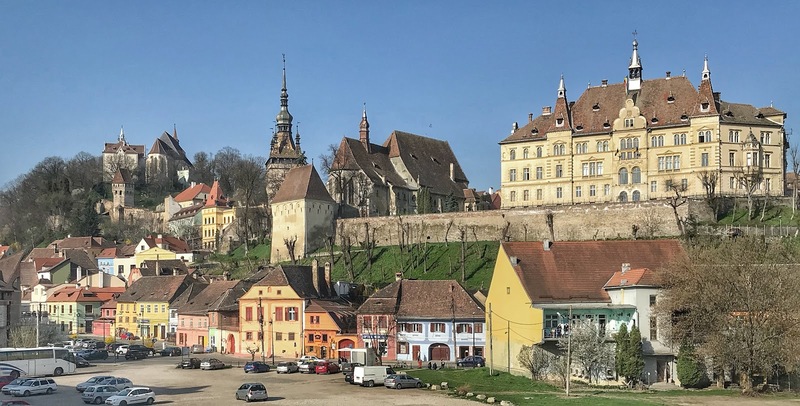 By 1191, these Saxons had established the town that eventually became known as Sighișoara, its Romanian name which first came into use in 1435. At the old town square we bought a souvenir from Tomas, a friendly vendor who offered a boatload of added value with the purchase. 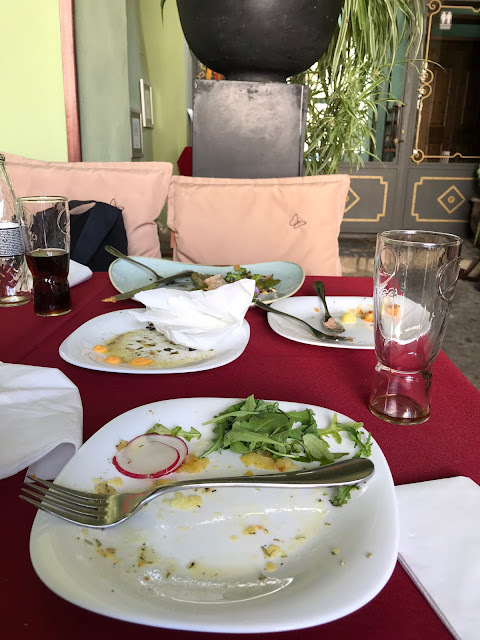 Not only did he tip us off to the best places in town to visit, he also steered us toward Cafe Georgius Krauss, a cozy spot in a 16th century building, where we enjoyed a delicious lunch. Still trying to stick with foods that have been cooked, we struggle to leave behind the foods we most want to eat. Arugula, my favorite salad green, and fresh radish left on my plate. Following Tomas's recommendation, though we needed no encouragement, we climbed the clock tower for some panoramic views over old town and the newer sections of Sighișoara. 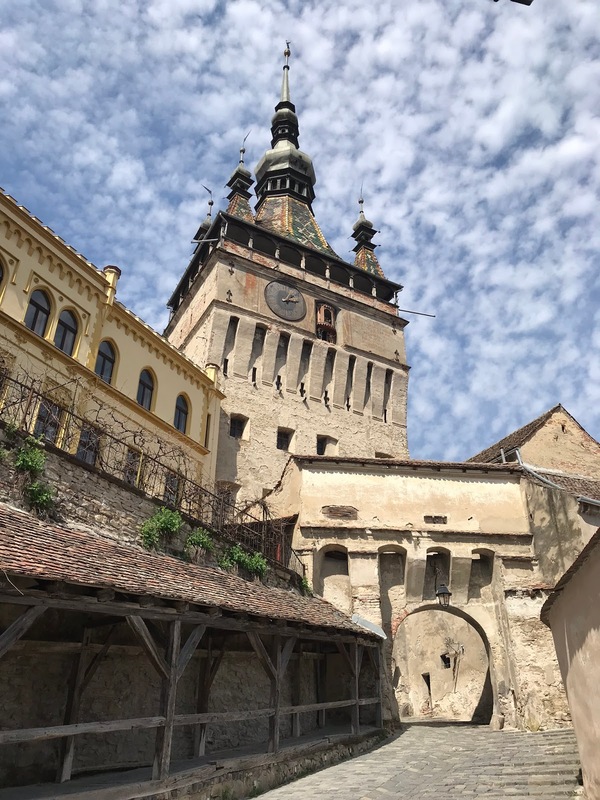 From the clock tower, we took a long walk up a very steep hill to the Saxon Cemetery and the Church on the Hill, another important Sighișoara landmark, sitting at an elevation of 1,408 ft. Exact origins of the church's construction vary from the 13th to the 15th century. Originally a Catholic house of worship consecrated to St. Nicholas, the church was taken over by the Saxon Lutherans in 1517 after the Reformation. 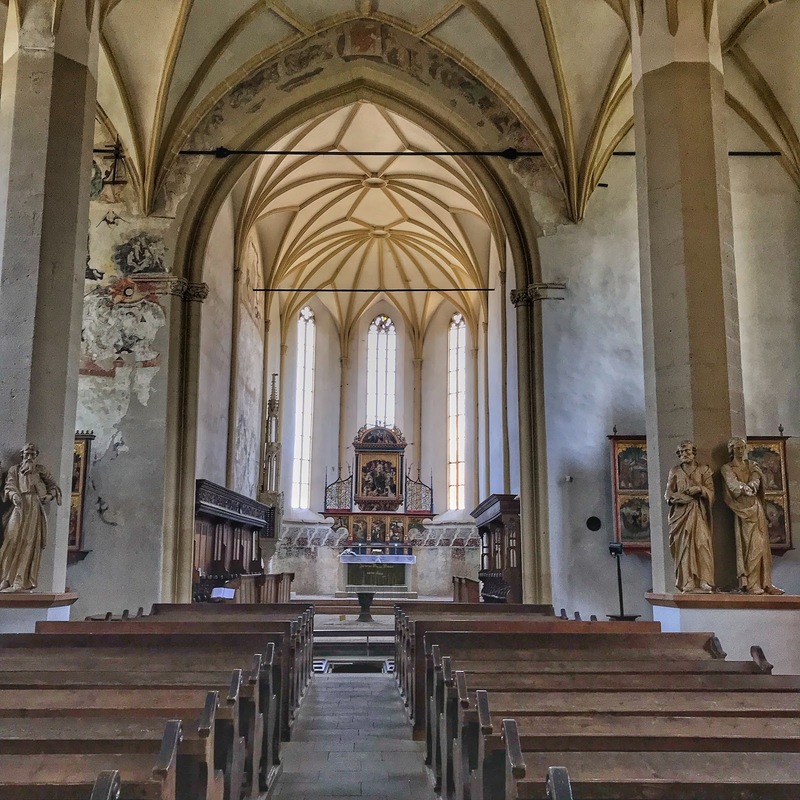 As so often happened when European churches were "Protestantized," colorful frescoes on the church's interior walls created over the course of many years by masters of Gothic and Renaissance painting were whitewashed over by the Protestants. A few fragments were uncovered and restored in the early 20th century. Below the altar is the only ancient crypt found in Transylvania. Visitors are encouraged to venture down a dark set of stairs to check out the old burial chamber. The opening to the crypt can be seen in the above photo between the aisle and the altar. 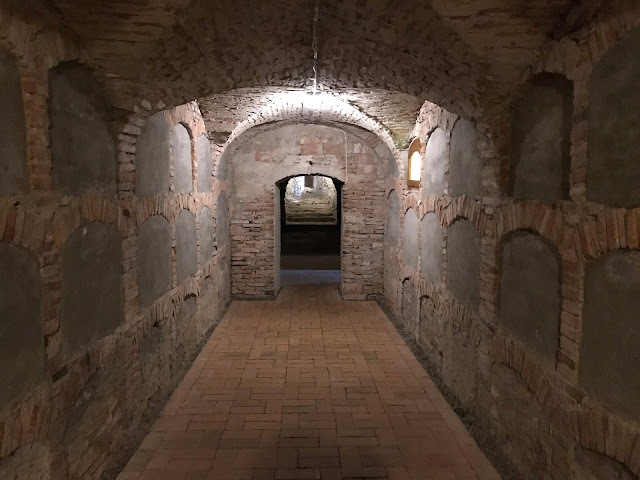 Unfortunately, the crypt has been vandalized several times by thieves looking for valuables in the tombs of city leaders enshrined there. 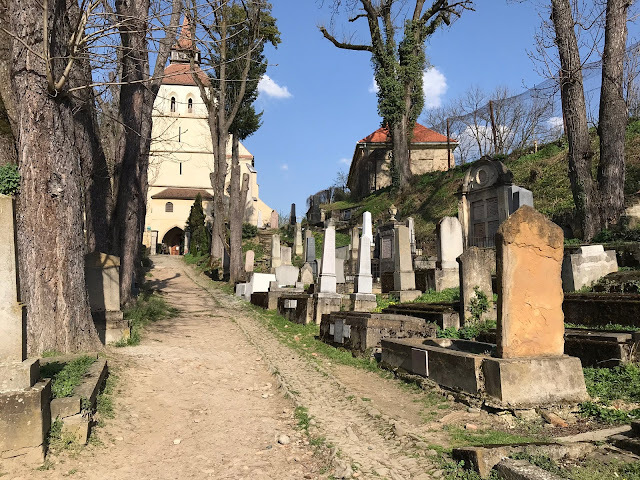 While visiting the Saxon cemetery adjacent to the church, we found just the right spot to hide a letterbox, our souvenir to the city of Sighișoara. A letterbox is hidden here. 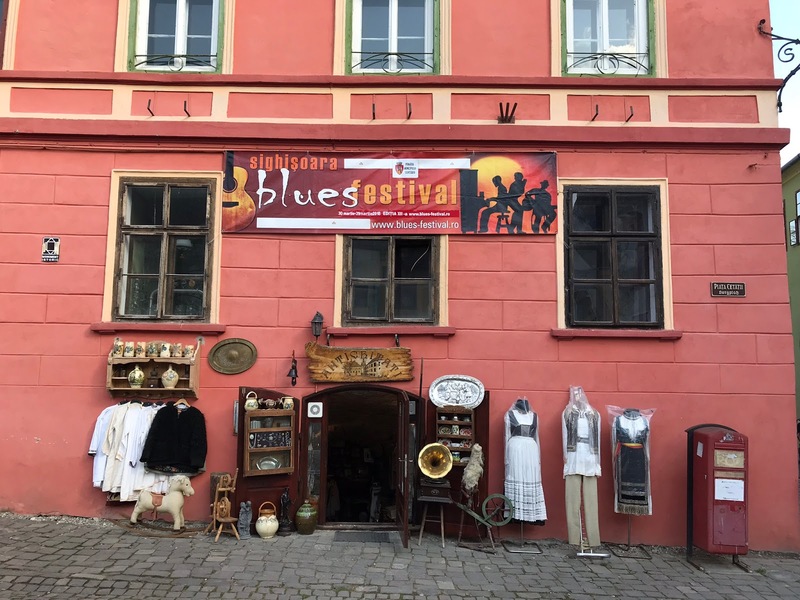 After our trek back down the hill from the church, we wandered old town a bit more before continuing downward back to the hotel. Along the way, we visited a new Lidl grocery store and stocked up on a few essentials since we have a car and can carry extra bags more easily. We were sad to walk deliberately past the produce department but pleased with how much we were able to purchase for $16. 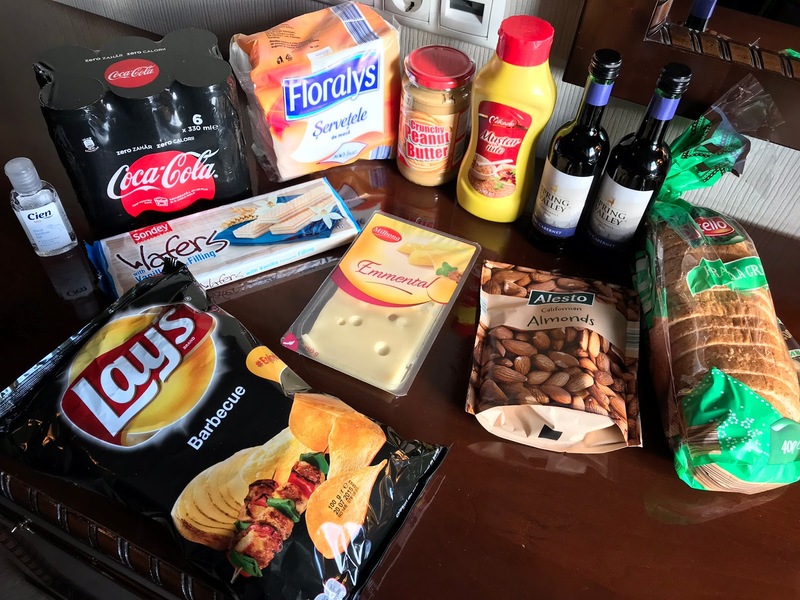 It was quite a contrast to prices we saw in Scandinavia last summer. Tomorrow we'll continue our way toward Bucharest, stopping for a couple of days in the city of Brașov, located in the southernmost reaches of Transylvania. Learned: We used to own a house built in 1914. In Atlanta, which was mostly burned during the Civil War, it was among the oldest houses in town. 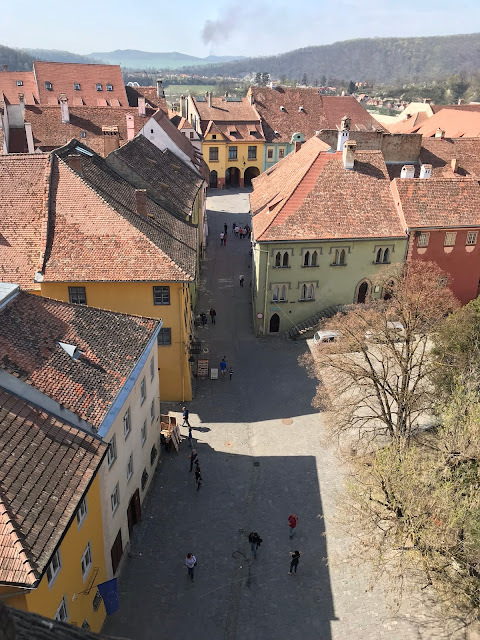 We gained a new perspective on this when we learned that Sighișoara's old town contains 164 houses that are at least 300 years old, most of which are still residences. The Blues Festival banner caught our eye, not the shop's wares. We missed it by ten days. 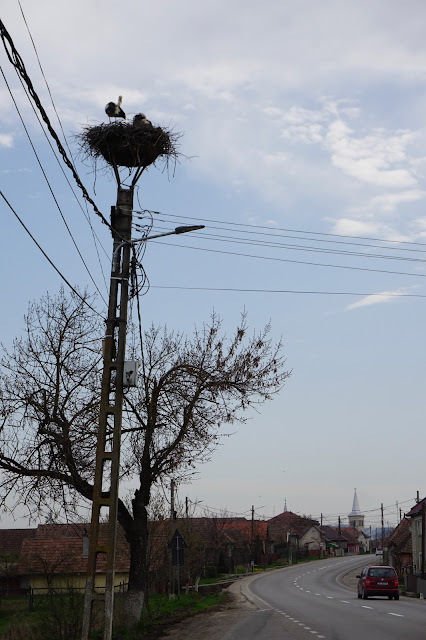 Storks in a roadside nest were unflappable as traffic rushed past.